Please support independent music. 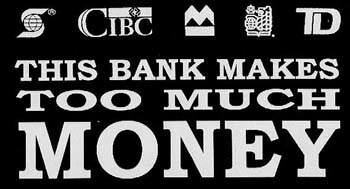 Buy a t-shirt for $19.95 CAD post-paid via paypal. Features the official Coat of Arms on a tricolor background. Blue for our ocean and coastal mountains, grey for our skies and market economy and green for our bountiful landscapes and, ahem, market economy. The motto "subra novus curatio" ('under new management') is incorporated with the crossed squeegee's and national fish to form the coat of arms. And as always, our original designs. Postcards also available in all three designs. Cards are 50 cents each or 5 for $2.00. 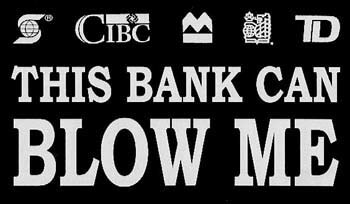 Anti-Bank shirts are black with light blue text and cost $19.95. The Cascadian flag appears on a white shirt and also costs $19.95 ppd. All three are printed on both sides with the Larry logo on the back. 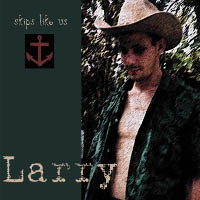 Larry's new CD, Skips Like Us also available through the Bank-B-Gone website. CD's cost $15.00 ppd.